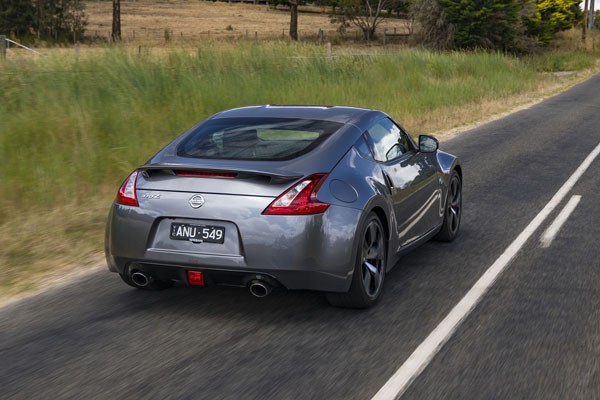 Despite its longevity, there is something of an enigma about the Nissan 370Z: is it a comfy Coupe with two seats; or an out-and-out sports car with performance paramount to the detriment of all else? I suggest it’s the former. Sophisticated is a way of putting it, something the car has exhibited since its inception almost a decade ago as the descendent, via the 350Z and others, of the legendary 240Z of the 1960s. And, for good or bad, not much has changed. oupe, accounting for 95 per cent of sales, or a Roadster with retractable soft top, has undergone a stylish rework that sets it apart from its predecessor. Prices start at just $49,990, plus on-road costs, for the six-speed manual Coupe – the seven-speed auto chiming in at $52,490 – while the range-topping soft-top Roadster automatic can be had for $63,490. On test was the Coupe automatic at $52,490. The 2018 still has the classic shape – low stance with long bonnet and raked rear roof – that has stood the ‘Z Cars’ in good stead over time. Now it features smoked lights front and rear, plus a smoked finish on exterior door handles and new-look 19-inch alloy wheels. The test car was finished in the new, richer Cherry Red instead of the superseded Bordeaux. Little has changed, so, sad to say, things are looking a bit dated. While there’s four-way power adjustable driver’s seat, including manual lumbar adjustment and four-way manual height adjustment, plus four-way power adjustable passenger’s seat, both with heating, storage is at premium. Boot space likewise. 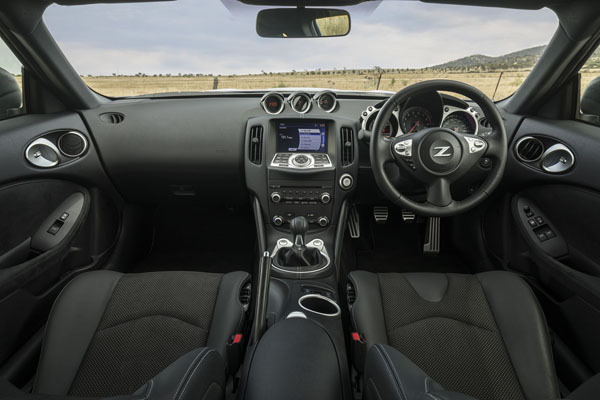 The 370 Z is fitted with a 7-inch colour touch screen with satellite navigation with 3-D mapping, plus Bluetooth as standard equipment. A trip computer keeps track of average speed, distance to empty, average and current fuel consumption and outside temperature, as well as offering a timer and trip meter. Quality audio is courtesy of a Bose CD player with AM/FM radio, MP3/USB/WMA capability, aux connection and eight speakers, including two subwoofers. 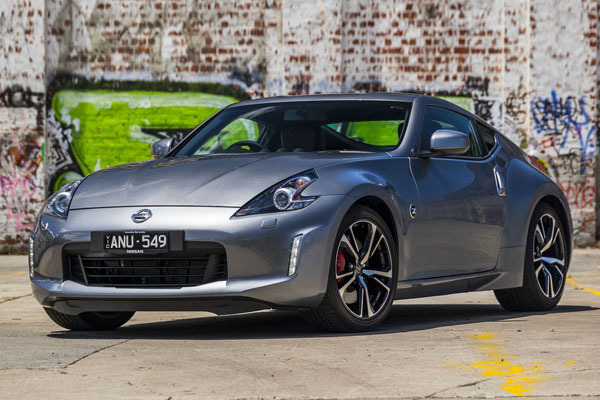 The 370Z engine is unchanged from the Nissan tried-and-tested 3.7-litre V6 that cranks out 245 kW of power 7000 rpm and peak torque of 363 Nm at a high 5200 revs. The maker claims fuel consumption of 10.4 litres per 100 kilometres for the auto vehicle. Nissan’s premium braking system includes anti-lock braking, electronic brakeforce distribution and brake assist. Vehicle dynamic control is also on hand, as are dual front, side and curtain airbags. Getting in and out of the car creates the inevitable two-door trauma – wide opening arc for extra large door, seats set low and sleek roofline ready to make contact with an unsuspecting head. Once inside, the seats offer major adjustments to settle driver and passenger in relative comfort. Not so good for the driver is the limited view behind through the steeply sloping rear window and the mother of all blind spots. Make sure you’ve got your mirrors set correctly or the blind spot could cause a crash. Moving off is best achieved with sure-footed use of the accelerator. A sporty engine note improves with pedal pressure. The seven-speed automatic transmission shifts smoothly and efficiently through the range, even when running hard using the steering wheel-mounted paddles in manual mode. Rear-wheel drive adds to the traditional Z-car experience with the absence of excessive understeer while pushing through fast bends. In many ways the Nissan 370Z is showing signs of ageing and the competition is far keener than when the vehicle debuted. No doubt fans will not be moved. This is offset by the very low price of the big Z. These prices do not include government or dealer delivery charges. Contact your local Nissan dealer for drive-away prices.